It is time, and we are ready, willing and able, to use our dowsing tools for the co-creation of a long-held desire for world-wide peace and prosperity, that we so deserve. The cosmic energies are happy to assist, the elemental kingdom is awaiting our requests, ALL of our spiritual friends that are working with the light are listening, so let’s do it. 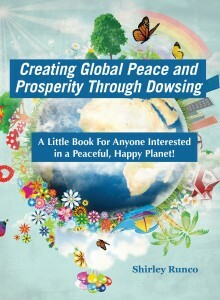 I will be sharing ideas from my new book, “Creating Global Peace and Prosperity Through Dowsing ~ A Little Book for Anyone Interested in a Peaceful, Happy Planet,” starting with the importance of self-love! We are starting a new adventure on this planet that will ultimately see many positive changes that will affect our subtle bodies and enhance our intuition. So, follow your spirit without hesitation and watch your world expand quickly! I look forward to sharing my passion with you, so come prepared to dowse and have fun! 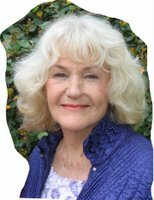 Shirley Runco, Master Dowser, believes that the dowsing tool is the most powerful tool for transformation on the planet. She resides in Northern California, and is currently the American Society of Dowser’s NorCal Regional Vice President, an Ambassador and Newsletter Editor for the East Bay Women’s Network, an Ambassador with the San Leandro Chamber of Commerce, on the Board of Trustees for the Principled Academy, a private school in San Leandro with comprehensive character education for preschool through 8th grade students, the owner of Global Weather Modification Services and Pendulums, Pendants, Etc. She teaches a monthly Pendulum Dowsing Class and is available for professional consultations. Shirley can be reached by calling 510-278-3136, or e-mailing dowsershirley@hotmail.com, or visiting www.dowsersofthewest.org.